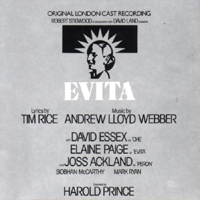 Original London Cast, 1978 (EMI) (2 / 5) Elaine Paige has one of the greatest musical theater voices ever, but much of her performance on this cast album of the world premiere stage production of Evita is disappointing. It almost sounds as if she’s holding back at times so as not to blow out her voice. To give only one example: When she reaches the high-lying bridge of “Buenos Aires,” she finesses the passage rather than delivering it in the gleaming, full belt for which she’s famous. It’s understandable that Paige would make vocal adjustments to get through eight performances a week of this killer role onstage, but its hard to imagine why she didn’t give her all for the recording. The other featured soloists — Joss Ackland, David Essex, Siobhan McCarthy, and Mark Ryan — are fine, but their roles have been more persuasively recorded by others. Another big strike against the album is that it presents only highlights of the score. — M.P. Original Broadway Cast, 1979 (MCA, 2CDs) (5 / 5) With her amazing, industrial-strength singing voice and serious acting chops, Patti LuPone might have been born for the part of Evita. She belts “Buenos Aires,” “A New Argentina,” and other songs to thrilling effect, yet she’s vulnerable and moving in “Don’t Cry for Me, Argentina,” “Eva’s Final Broadcast,” and “Lament.” Simply put, she’s definitive in this role. Mandy Patinkin brings to Che a unique combination of sweet, Irish-tenor-like high notes and a cantorial geshrei when he belts. Bob Gunton gives a sly, skillful performance as Juan Peron; he leads “The Art of the Possible,” a neat song that wasn’t on the concept album of Evita, and he has great chemistry with LuPone in “I’d Be Surprisingly Good for You” and “Dice Are Rolling.” As Peron’s young mistress, Jane Ohringer offers a lovely lyric-soprano rendition of “Another Suitcase in Another Hall”; she really does sound like a teenager, which helps the song dramatically. Mark Syers, who died in a car accident about four years after this recording was made, is a fine Magaldi. The more rock-like sounds of the original arrangements and orchestrations were toned down for the stage version of the score; for example, the electric guitars in “Requiem for Evita” are replaced by trumpets. Also, the aggressively anachronistic rock ‘n’ roll number “The Lady’s Got Potential” is gone entirely. The orchestra, augmented for this recording, sounds huge and exciting under music director Rene Wiegert. 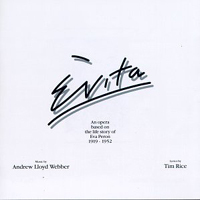 If you want only one recording of Evita in your collection, this is the one to choose. (Note that it is actually labeled the “Premiere American Recording” of the score and was recorded in Los Angeles, where the show played prior to reaching Broadway.) — M.P. 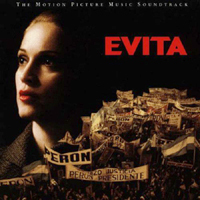 Film Soundtrack, 1996 (Warner Bros., 2CDs) (2 / 5) A film version of Evita was in the planning stages for years. When the movie was finally ready to roll with Madonna as Eva Peron, there was widespread consternation at the casting, since none of the pop star’s recordings gave any reason to believe that she’d be able to handle the vocal demands of such a difficult, rangy role. As it turned out, much of the score had to be transposed downward and rearranged for her to get through it. Not surprisingly, Madonna sounds best in the less demanding sections. Although “Don’t Cry for Me Argentina” takes some getting used to in a lower key, she sings it pretty well if not with great feeling. She also does an okay job with “Another Suitcase in Another Hall,” but it’s unfortunate that this lovely song was taken away from the one-scene character of Peron’s mistress in order to give Eva/Madonna another number. The star flattens some of the rhythms in “Eva and Magaldi”/”Eva, Beware of the City” (Jimmy Nail sings Magaldi), and she also seems to have some pitch problems in this sequence, although the music keeps modulating so wildly to accommodate her limited vocal range that it’s hard to be sure. Also, Madonna gets the vowels and diphthongs of the words “Buenos Aires” all wrong, rendering the city name as if it were spelled “Buenes Arres.” For a plausible Spanish accent, look to Antonio Banderas, who sings Che’s songs with charisma, passion, and beautiful tone. Jonathan Pryce is an authoritative presence as Juan Peron — a brilliant bit of casting. As presented here, the score sounds a lot like it does on the concept album. There are some twanging electric guitars in the “Requiem” and “The Lady’s Got Potential,” the latter song reinstated with new lyrics, and these sounds are not all of a piece with some more authentic re-scoring for acoustic guitar and accordion. The movie and its soundtrack album are notable for including a new Lloyd Webber-Rice ballad, “You Must Love Me” — yes, another song for Eva/Madonna! As conducted by John Mauceri, David Caddick, and Mike Dixon, the orchestral score sounds impressive despite the more obvious instrumental anachronisms and the jarring transpositions and modulations for the leading lady. — M.P. 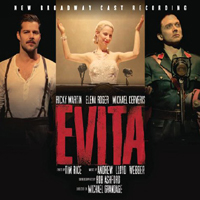 Broadway Cast, 2012 (Sony, 2CDs) (1 / 5) Elena Roger was acclaimed for her title role performance in a London revival of Evita, but when she came to Broadway as Eva Peron, many critics and audience members found her singing voice unequal to the assignment, however persuasive she was as an actress. Conversely, although former pop star Ricky Martin displayed almost no acting talent as Che, moving through the entire show with the same smirk on his face no matter what was happening in the plot, he sang the role well from a purely musical standpoint. So, on the cast recording, Martin’s performance is enjoyable but Roger’s is not. Broadway stalwart Michael Cerveris is excellent as Peron, while Max von Essen and Rachel Potter respectively make the most of the small roles of Magaldi and Peron’s young mistress. 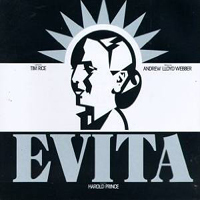 The cast album has other pluses, but unfortunately, any recording of this score with a performer whose singing is so unpleasant in so much of Evita’s music is ultimately not worthwhile — M.P.